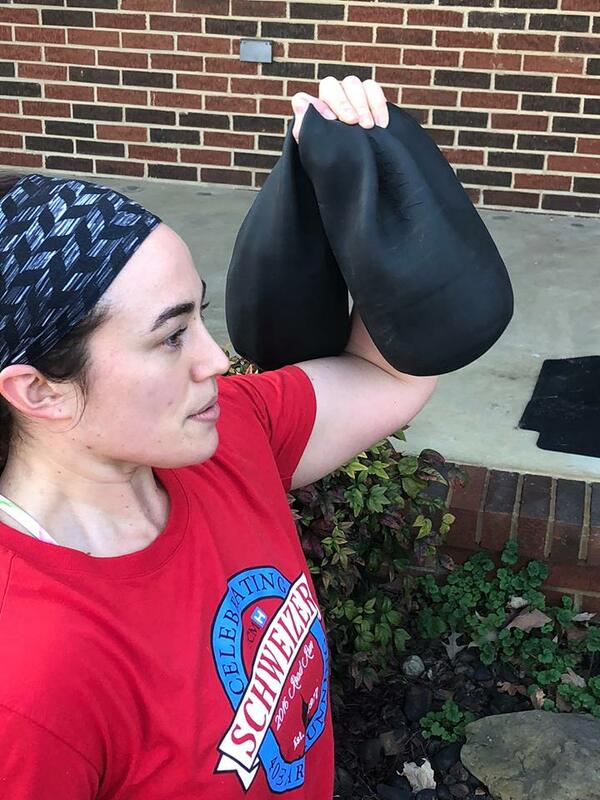 Included Shotbells were custom designed to allow one DisruptiveStrong Bag to vary in weight, and can also be used like a dumbbell, kettlebell, barbell, medicine ball, and slam ball without bursting or damaging floor surfaces. Life happens in multiple planes of direction, but traditional fitness has led us to train in only two directions. Training in only two planes of motion creates muscular imbalances and puts us at risk for injury and poor function. With DisruptiveStrong, you can incorporate real world movement patterns with each workout, and start to look better, feel better and perform better. CHANGE THE WEIGHT: The DisruptiveStrong Bag is incredibly versatile. The workout bag itself weighs 10 pounds and you can add our Shotbells to add weight. Each Shotbell weighs 10, 20, 30, or 40 pounds. That means you can add up to 100 pounds for the training bag to weigh up to 110 pounds. The Shotbells can also be used like a dumbbell, kettlebell, barbell, medicine ball, and slam ball. Our bag is perfect as a heavy punching or striking bag and great for weighted workouts and MMA training. DURABLE AND STURDY: Our fitness bag is sturdy enough to slam, drag, strike, swing, and lift while holding all of the steel shot bags inside. A durable vinyl material makes the outer shell and a flexible neoprene cylinder makes up the inside. The reinforced handle stitching helps make it resistant to tremendous intensity. It makes for great youth fitness equipment and boxing and MMA equipment. 5 GRIP OPTIONS: The DisruptiveStrong Bag is great with its 5 different hand grips. For a wide grip, grab the handles on the edges of the bag. To get a neutral grip, use the handles perpendicular to the bag. To get a suitcase-like grip, hold the center handle. For an overhand or underhand grip, use the handles parallel to the bag. Add the DisruptiveStrong Bag to your home exercise equipment. APP WORKOUT BONUS: You don’t just get an amazing weightlifting bag. You also get a DisruptiveStrong workout app, which includes over 1,000 unique exercises and over 350 always different workouts that get updated every month to help you so you’re always gaining muscle and burning fat with your Strong Bag. 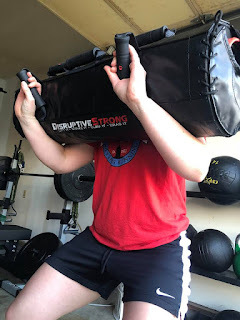 Up your weightlifting workout routine with the DisruptiveStrong Bag and our workout app. 3-YEAR WARRANTY: Each purchase of workout equipment comes with a “7 Guidelines to Shed More Fat” PDF and a 3-year warranty in the unlikely event of defects in the product's materials or manufacturing. Dragging or slamming the Shotbells and Strong Bags on abrasive and sharp surfaces such as gravel, rocks, grass with sticks, etc. will void the warranty. Meet the DisruptiveStrong Bag: a training bag that you can strike, slam, lift, or drag to burn calories and build strength in your body. You will be able to change its weight from 10 to 110 pounds. The bag supports over 700 exercises, many of which simulate functional everyday movements. You can use the Shortbell filler weights like a dumbbell, kettlebell, or barbell. 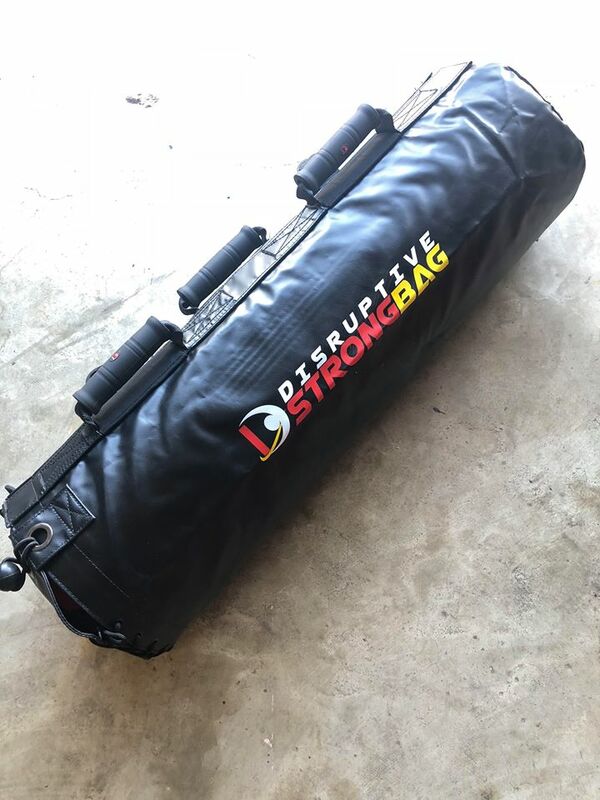 As a complete training system, the DisruptiveStrong Bag is soft enough to strike, but strong enough to take abuse. It is a padded cylinder that can be filled with small, weighted bags to create a weight from 10 to 110 pounds. The cylinder can be used for a martial arts workout or it can be used like a dumbbell or kettle bell for weight training.You can use the Shortbell filler weights like a dumbbell, kettlebell, or barbell. The solid yet flexible inner core and the soft, shock-absorbing outer shell are two key qualities that allow you to lift, strike, slam, and drag this remarkable tool. From military grade vinyl to double and triple stitching to soft, resilient silicone handles, the DisruptiveStrong Bag was built for comfort, sleekness, and longevity. The most impressive piece of equipment on the market by far! It is very easy to use and can be used in the comfort of your house and easy to travel with. Literally hundreds of exercises can be done with the equipment, so your workouts are versatile and not repetitive. You will gain strength and muscle while losing fat and inches. Anyone despite their current fitness level can utilize this equipment because weight is easily added! Well worth the investment. I regularly work out at a CrossFit Gym and every time I workout with the Disruptive Strong Bag I am completely sore all over again. It hits muscle groups that no other method of working out can due to the weight shifting and sand movement. 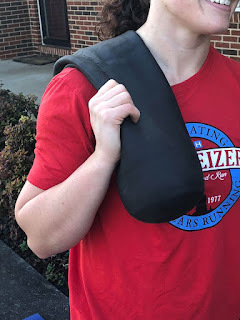 The design and durability makes it a great long term investment and a great workout tool and easily portable for workouts on the go. It arrived at my door and the first thing I noticed was the quality as it was pieced in about 6 different packages. For most people its going to take a while to get used to the weights. It's unconventional and I can tell this thing is going to make you work. The shotbells are either heavier or I'm just not as strong as I think. The handle is a huge plus. The workouts you can perform are endless. The bag is durable and versatile. You get multiple grip options and an easy weight changing mechanism. In conclusion, this product is strong, versatile, and extremely convenient. The bag and shot bells allow me to perform the functional fitness workouts I am accustomed too. I no longer have to go to the gym to use different weighted sandbags, Bulgarian bags, and different kettle bells. I was looking for something that did it all in one complete package and allowed for me to travel with it. That's when I found the Distruptive Strong Bag, the Swiss Army knife for fitness training. This product is legit and will push you to the next level in training.